It is great to see the first OpenLaszlo book on the market. The book presents straightforward tutorials which do a good job of introducing the LZX you need to know to build simple applcations. 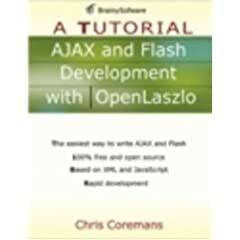 If you are someone who really likes to have a physical book rather than on-line documentation this book will give you a good foundation in learning OpenLaszlo. When introducing new classes, the book provides a graphical class hierarchy to illustrate how the class fits in. In addition to the basics, Chapter 15 details a Google Maps application by Manabu Togawa which provides a good real-world example of browser integration.